New ListingSquier Vintage Modified Jazz Bass 70s 4-string Electric Bass - Natural , New! Body Shape: Jazz Bass®. Neck Pickup: Duncan DesignedTM JB101 Single-Coil Jazz Bass®. 4-string Electric Bass. Bridge Pickup: Duncan DesignedTM JB101 Single-Coil Jazz Bass®. Nut Material: Synthetic Bone. New ListingSquier Vintage Modified Jazz Bass Left-Handed 3-Color Sunburst , New! Body Shape: Jazz Bass®. Bridge Pickup: Fender-Designed Single-Coil Jazz Bass. Middle Pickup: Fender-Designed Single-Coil Jazz Bass. 4-String Left-Handed Bass Guitar. String Nut: Synthetic Bone. Neck Shape: "C" Shape. 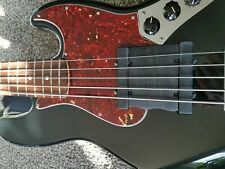 A hardly touched but beautiful my appointed Jazz bass with monster sound. SKU: 0374540500 – Manufacture: Squier. Truss Rods – Head Adjust. Color – 3-Color Sunburst. Series – Classic Vibe. Body Shape – Jazz Bass®. String Nut – Bone. Bridge Pickup – Fender® Designed Alnico Single-Coil. Condition is Used. This Bass was only used in the studio for recording purposes and practice. I have tried to best describe everything about this bass. This has changed the entire sound from the original which was very limited. I Think I got the title right, Great bass 4 string, great action, like new condition, super sweet bass! Case not included. Country of origin: Indonesia. Fingerboard material: maple. Neck shape: C.
Truss rod: Standard. Neck: Fender-designed single-coil Jazz Bass. Bridge: Fender-designed single-coil Jazz Bass. Series or parallel: Parallel. Orientation: Left handed. Nut material: Synthetic bone. Neck joint: Bolt-on. Body Material: Soft Maple. Body Shape: Jazz Bass®. Neck Material: Maple. Bass Guitars. Fingerboard: Maple. String Nut: Synthetic Bone. Bridge Pickup: Fender-Designed Single-Coil Jazz Bass. Middle Pickup: Fender-Designed Single-Coil Jazz Bass. 34" Scale Length. No RMA needed! Most of our guitars are individually photographed, and are set-up with care by our in-house luthier. Solid ash body in 3-tone sunburst by USA Custom Guitars (USACG). The holes/screws do not affect the functionality of the bass at all, and to be honest I barely even notice them now. Up for grabs here is a very nice custom built Jazz-style bass. Player-centric specifications include a slim and fast "C"-shaped neck profile with a 12" fingerboard radius ideal for speed-demon bass runs, while a modern bridge provides titanic rumble with optimal stability. New Gear: If you’re not satisfied, neither are we. It’s that simple. Check-Out Now! 4005 N Norfleet. item# 1500000217766.